How to use Wikipedia in your research as well as how to contribute to it. Wikipedia experience not required. We will teach you what you need to know! Create a Wikipedia account for yourself in advance. If you encounter an Account Creation block, use this link and click the Request an account button. Who should attend: People of all gender identities and expressions. Please ask your fellow attendees for their pronouns of choice! Approximately 16 iMacs will be available. Please bring your laptop, power cord and ideas for entries that need updating or creation. For the editing-averse, we urge you to stop by to show your support. An Edit-a-thon is a community organized event that aims to teach folks how to edit, update, and add articles on Wikipedia. These events take place year-round at museums, coffee shops, colleges, and community centers. 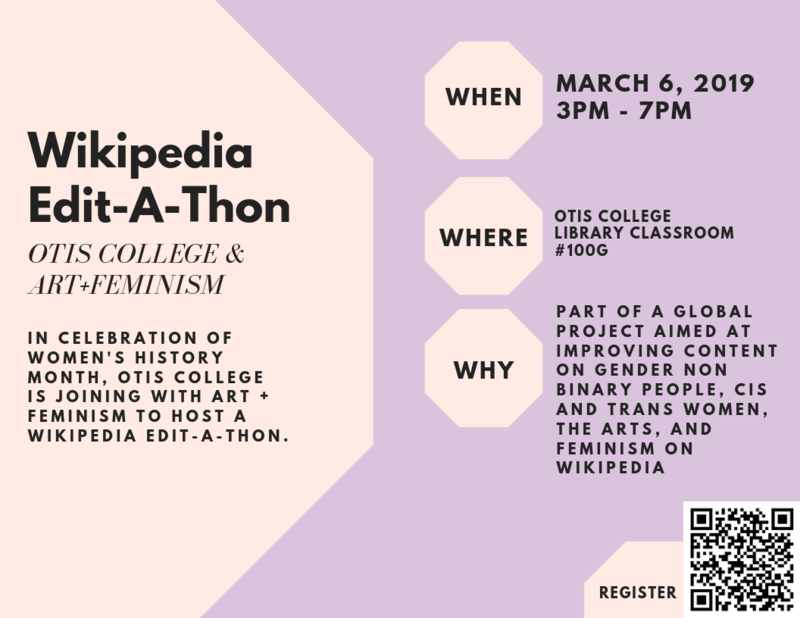 Art and Feminism (stylized as Art+Feminism) is an annual worldwide edit-a-thon to add content to Wikipedia about gender non-binary people, cis and trans women, the arts, and feminism. The project has been described as "a massive multinational effort to correct a persistent bias in Wikipedia, which is disproportionately written by and about men." Art+Feminism's annual campaign attract thousands of volunteers at hundreds of separate events internationally. Q: Is it a conflict of interest to work on entries of people affiliated to Otis College because we are hosting the event? A: Maybe. Please refer to the guidelines below. Be transparent about your conflict of interest. Do not edit articles about yourself, your family or friends, your organization, your clients, or your competitors. Post suggestions and sources on the article's talk page, or in your user space. The role of editors is to summarize, inform, and reference, not promote, whitewash, or sell. Subjects require significant coverage in independent reliable sources. State facts and statistics; don't be vague or general. Take time to get sources and policy right. Get neutral, uninvolved, disinterested editors to review your suggestions. Respect the volunteer community's time and avoid making protracted or repeated requests. You may work on any entry in Wikipedia, though we hope it will be one related to Art+Feminism. On Wikipedia, notability is a test used by editors to decide whether a given topic warrants its own article. Information on Wikipedia must be verifiable; if no reliable third-party sources can be found on a topic, then it should not have a separate article. Wikipedia's concept of notability applies this basic standard to avoid indiscriminate inclusion of topics. Article and list topics must be notable, or "worthy of notice". Determining notability does not necessarily depend on things such as fame, importance, or popularity—although those may enhance the acceptability of a subject that meets the guidelines explained below. It is not excluded under the What Wikipedia is not policy. This is not a guarantee that a topic will necessarily be handled as a separate, stand-alone page. Editors may use their discretion to merge or group two or more related topics into a single article. These guidelines only outline how suitable a topic is for its own article or list. They do not limit the content of an article or list. Full-text articles from 630 art and design magazines, 220 books, and 63,0000 images + 3,100 multidisciplinary periodicals. To search across print, subscription, and Web-archived material from museum libraries in New York, try NYARC Discovery (some results will be full text). Wikipedia is the 5th most popular website in the world. Wikimedia’s gender bias is well-documented. It is among the most frequent criticisms of Wikipedia, and part of a more general criticism about systemic bias in Wikipedia. Wikipedia has fewer and less extensive articles about women or topics important to women. This represents an alarming absence in an increasingly important repository of shared knowledge. 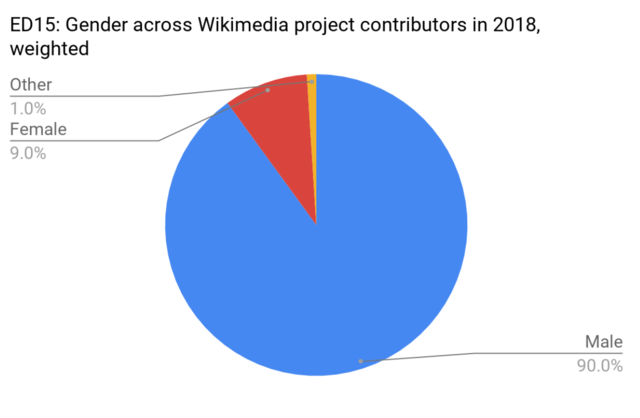 The Wikimedia Foundation, which runs Wikipedia, agrees with these criticisms and has made an ongoing attempt to increase female editorship of Wikipedia. The record for the most expensive work by a living woman artist at auction was set in 2018 by Jenny Saville, whose painting Propped (1992) sold for $12.4 million. This sum is still dwarfed, of course, by the record for a living male artist, also set in 2018: a David Hockney painting that sold for $90.3 million. At the same sale where Saville made history, less than 10% of the rest of the works for sale were by women artists. Women earn 70% of Bachelors of Fine Arts and 65–75% of Masters of Fine Arts in the U.S., though only 46% of working artists (across all arts disciplines) are women. Only 27 women (out of 318 artists) are represented in the 9th edition of H.W. Janson’s survey, Basic History of Western Art—up from zero in the 1980s. The top three museums in the world, the British Museum (est. 1753), the Louvre (est. 1793), and The Metropolitan Museum of Art (est. 1870) have never had female directors.